We are delighted to announce FREE comics workshops for kids, in partnership with Rebellion, in Dundee and Glasgow on Free Comic Book Day 2019! Free Comic Book Day on 4th May aims to encourage new readers to visit their local comic book store and Rebellion has a host of titles supporting this global celebration of comics! To mark the release of its Funny Pages and Cor!! 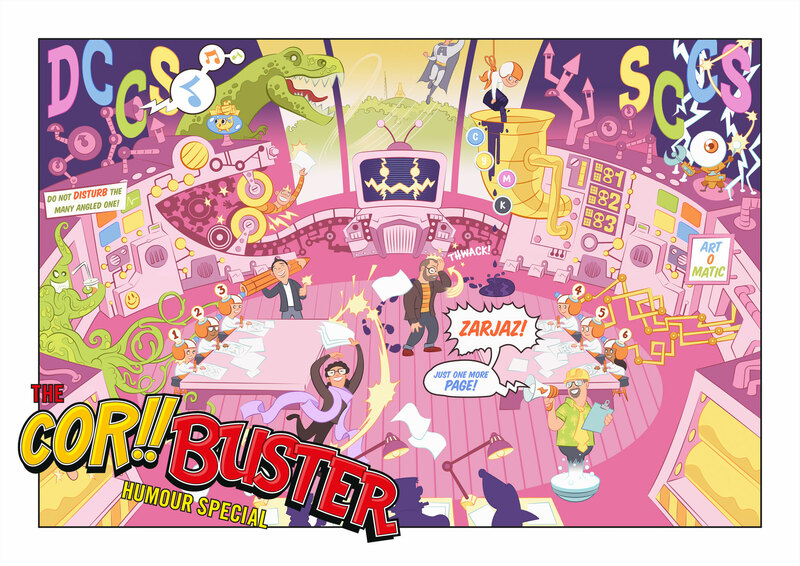 & Buster Special titles, 2000 AD and Dundee Comic Creative Space are taking over the studio at the Gallery of Modern Art in Glasgow, as well as DCCS HQ in the Vision building on Dundee waterfront, with special workshop events on 4th May. Both running from 1.30pm to 3.30pm on Saturday 4th May, the workshops will give kids of all ages the chance to have a go at creating their own comics based on characters from the legendary titles Cor!! and Buster! Posted on April 11, 2019 April 11, 2019 by dundeecomicscsPosted in Events, workshopsTagged 2000AD, buster, cor, dundee, free comic book day, glasgow, kids, rebellion, workshop. Comic Club – New Season!